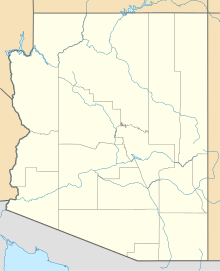 Pearce Ferry Airport (FAA LID: L25) is a public use airport in Mohave County, Arizona, United States. The airport is owned by the National Park Service. It is located 3.5 miles (3.0 nmi; 5.6 km) north of the central business district of Meadview and 2.9 miles (2.5 nmi; 4.7 km) east of Lake Mead's Gregg Basin. Pearce Ferry Airport covers an area of 8 acres (3.2 ha) at an elevation of 2,941 feet (896 m) above mean sea level. It has one runway designated 1/19 with a dirt surface measuring 2,900 by 110 feet (884 x 34 m). For the 12-month period ending April 20, 2010, the airport had 300 aircraft operations, an average of 25 per month: 67% air taxi and 33% general aviation. Was part of aircraft training simulation. ^ a b c FAA Airport Master Record for L25 (Form 5010 PDF). Federal Aviation Administration. Effective 29 July 2010. This Arizona airport-related article is a stub. You can help Wikipedia by expanding it.